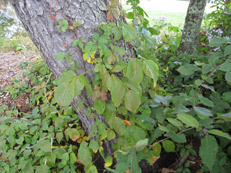 This is an example of poison ivy climbing a cherry tree. 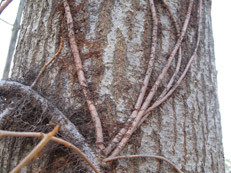 A more mature wintertime view of a leafless climbing poison ivy plant ascending an oak tree. 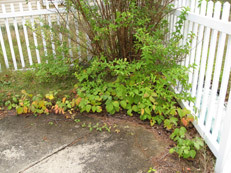 Non-climbing poison ivy as a ground cover will not ascend the white picket fence or climb the shrub pictured. 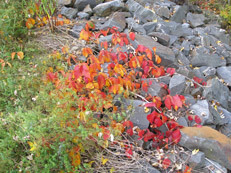 In its red and orange fall color, non-climbing poison ivy is at home cascading over a boulder field, along the Connecticut River in new Hampshire.